“I have an iPod Nano but I can’t sync it with Spotify to play my music tracks. I am able to put my Spotify music there, but I don’t understand the process at all! On connecting my iPod to the desktop version, the app fails to recognize the device and doesn’t pop up any options to sync songs to Spotify. Can someone help me out to resolve this issue? The fact is that for Spotify Free users, it is mandatory to have internet connection for playing Spotify songs and offline listening is not available. Whereas for Premium users, they can download Spotify songs for offline listening, either on PC with Spotify desktop app, or on iOS or Android with Spotify App. However, the downloaded songs are Ogg Vorbis file format with DRM protection and can’t be recognized or played on iPod Nano. Well, iPod Nano can only play MP3, M4A or WAV songs. If you want to play Spotify songs on iPod Nano, you’ll have to download Spotify songs in these formats. That is where a Spotify Music Converter comes into the picture, which has the ability to download Spotify songs and playlists as MP3, M4A or WAV. It further, preserves all ID3 tags like song title, album, artist, genre, artwork, year, etc. no matter you are using Spotify Free or Spotify Premium. Download the free trial version of Spotify Music Converter to have a try, which can convert 3 minutes of each song. Start the Spotify music downloader and Spotify program will be automatically launched as well. Don’t forget to keep running Spotify and do not close it during downloading and converting. It is easy to drag songs, albums or playlists directly from Spotify to Spotify Music Converter, or you can browse your favorite song, album or playlist in Spotify, then right-click to get the link of the song, album or playlist, and then paste the link in the search bar at the bottom of the program, followed by clicking + or Add button. Spotify Music Converter will analysis your input and pop up a dialog to ask you to choose what songs to download. By default, all the songs will be downloaded and you can uncheck the songs you don’t want to download. Spotify Music Converter supports MP3, M4A, WAV or FLAC as output format and MP3, M4A or WAV can be played on iPod Nano. Choose one of them depending on your need. By default, Spotify Music Converter will use 320kbps and 44100hz MP3 as output format. If necessary, click Options to change output format in the Advanced tab. Now, simply click Convert button to start downloading Spotify music to computer. All ID3 tags in Spotify songs will be preserved. Once you are done with conversion, you can click History button and open the output folder to locate the output songs. Attach your iPod Nano to the computer with USB cable. Launch iTunes and add the downloaded Spotify songs to iTunes library, create a playlist and add the Spotify songs to it, then sync to iPod Nano through iTunes. If you don’t want to install or use iTunes, there are many iPod transfer programs which can help to transfer local songs to iPod Nano directly instead of using iTunes. Generally speaking, such iPod transfer programs will be much more convenient than iTunes. 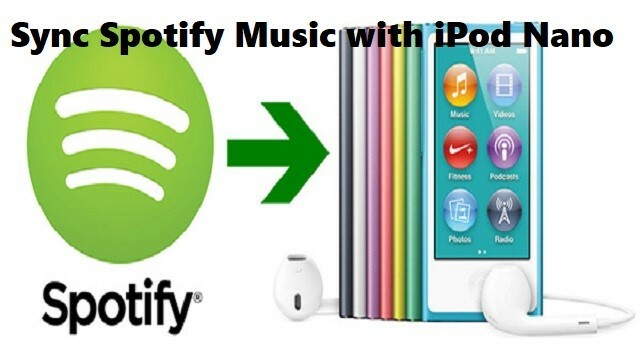 By using, either way, to sync Spotify Songs to iPod Nano, you can play your favorite Spotify songs on iPod without any limitation. Spotify Music Converter is easy to use software and is available for both Mac as well as Windows users. It even supports the latest macOS High Sierra and Windows 10. Though Spotify Music Converter can download Spotify songs, albums and playlists as MP3/M4A/WAV songs with either free or premium account, you can download Spotify songs with better audio quality if you have Spotify Premium subscription. What’s more, with Spotify Music Converter, you can not only enjoy Spotify songs on iPod Nano, but also on other iPod models like iPod Shuffle, iPod Classic, and iPod Touch as well as other MP3 players. How to Sync iPod Touch on Your Computer with USB?